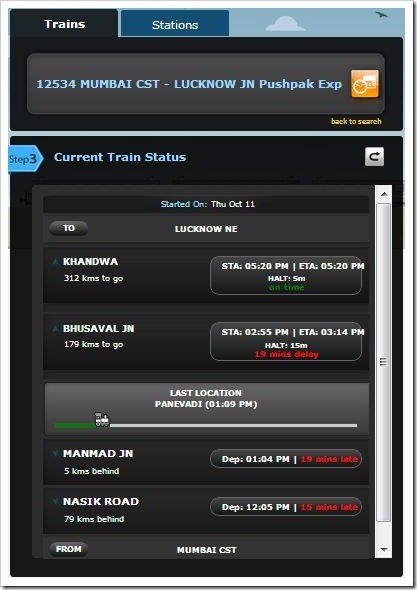 Indian Railways has launched RailRadar, an application which allows trains to be tracked in real time. 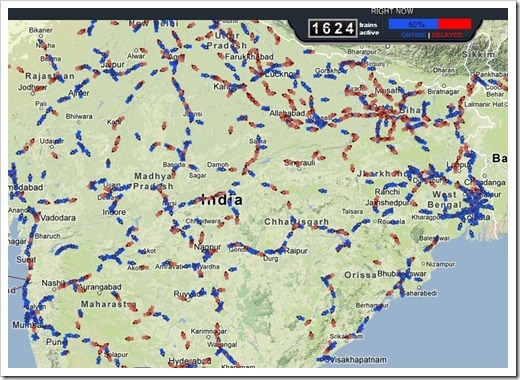 Rail Radar is essentially a visual way of showing status of trains – It uses the Google Maps platform to deliver timings, location, station, routes and schedules of more than 6,500 trains on a real time basis. RailRadar has been developed by Centre for Railway Information System and uses a top level colour coding system to mark trains as blue and red. Blue arrows indicate trains running on time while red arrows are those which have been delayed. Users can use the + and – buttons to zoom in and zoom out of the map. Clicking on an arrow will reveal train details and its route on the map. The details include the train’s number and name, last stop, station at which it will halt next and the train’s status as on-time or delayed in minutes. The real time status will generally be on a 5 minute delay. RailRadar also has a search feature in which users can enter a train number or the name of a train to find it on the map. A search query will list out matches and upon clicking on one of the results, users will be shown the exact location of the train on the map. Clicking on the train’s icon will reveal its details. Queries can also be made based on names of stations or their codes. At the time of logging onto the impressive looking portal, we found nearly 2,000 active trains being tracked. 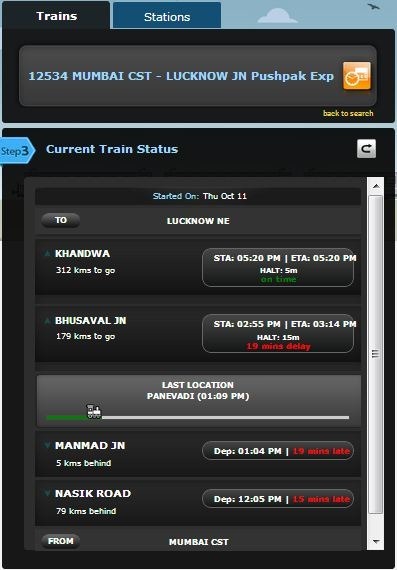 On the left sidebar we clicked on search and entered 12534, the train number for Pushpak Express. The results immediately revealed 12534 MUMBAI CST – LUCKNOW JN Pushpak Exp. Upon clicking, the map zoomed in to the exact location of the train. When the train’s icon was clicked on, real time details informed us that the train’s last update was at Kasara in Maharashtra and its next stop was Nasik Road. The status of the train was shown as On Time (The snap shot above was taken an hour later when the status had changed to 14m delay). Clicking on a small link given below opened a new tab directed to trainenquiry.com’s detailed status update. 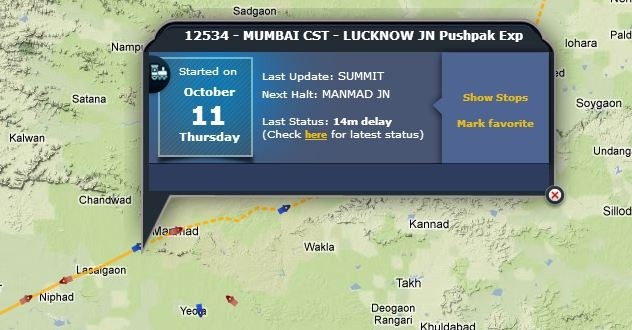 The page gave more details including how many kms the train was away from Nasik Road, its estimated arrival time and halt duration. Similar stats were provided for the previous and next two stops of the train. The website appeared to load quickly. Google Maps users will find themselves in familiar and comfortable territory while navigating through the map. Switching between trains and routes was seamless and the application did its job without getting stuck. RailRadar is set to allow travellers to track their trains in real time by simply logging onto a website as opposed to making calls, listening to announcements or flipping through timetables. This initiative comes at the back of many other technology driven undertakings by Indian Railways, one of the world’s largest rail networks, including a plan to provide Wi-Fi on trains, e-ticketing, SMS services and a push for online bookings. 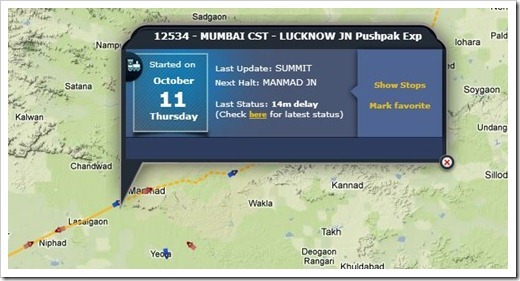 Overall, an excellent initiative and use of technology to bring much needed real-time information to masses! Now, Send Free SMS through your Gmail! IRCTC Offers Goa Package For Rs 400; Kickstarts International Cruise Packages! It is a good app. Looks great…tried on my android and loads pretty quickly…India has lot of potential to innovate such application….